Today I have a few new products I’ve been testing that I want to share with you! A little over a year ago, my little sisters totally got me into snapchat. I love to follow my friends, family and also my favorite bloggers and celebrities. 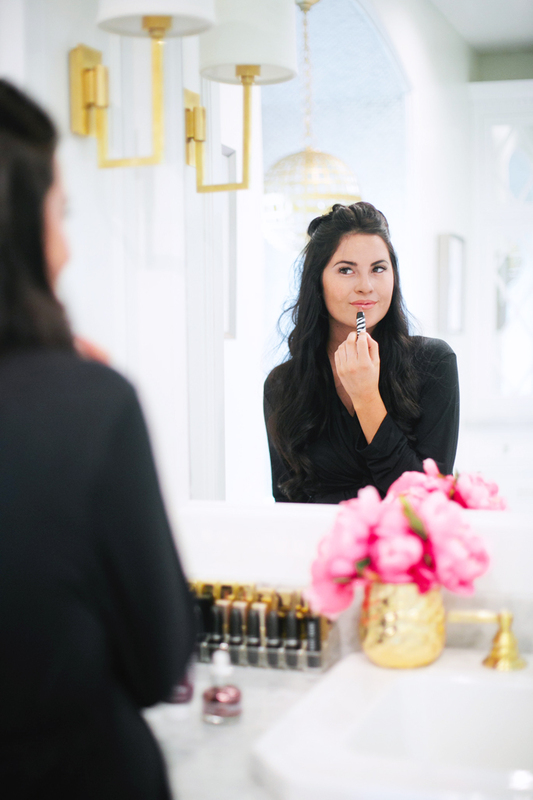 A few of the bloggers and celebrities I follow will every so often share their nightly skin-care routines. I’ve noticed every time they share them, they are always doing some type of mask at night. I’ve used a few masks before, but not very often, now thanks to snapchat I started religiously using masks a few times a week and I’ve tried so many I love! I actually should probably snap about it and share all of my favorites with you all, I really have seen the benefits in my skin from using them! One of the brands I have been wanting to try is Sisley Paris, so I jumped at the chance to partner with them. I tried their Black Rose Cream Mask and their Black Rose Face Oil. Both products have anti-aging elements in them and use natural ingredients to restore moisture in your skin and keep it looking fresh, bright and young. The Black Rose Cream Mask is filled with anti-aging elements like black rose, padina pavonica, and alkekengi calyx extracts. I love that this treatment uses natural ingredients and essential oils to nourish the skin. 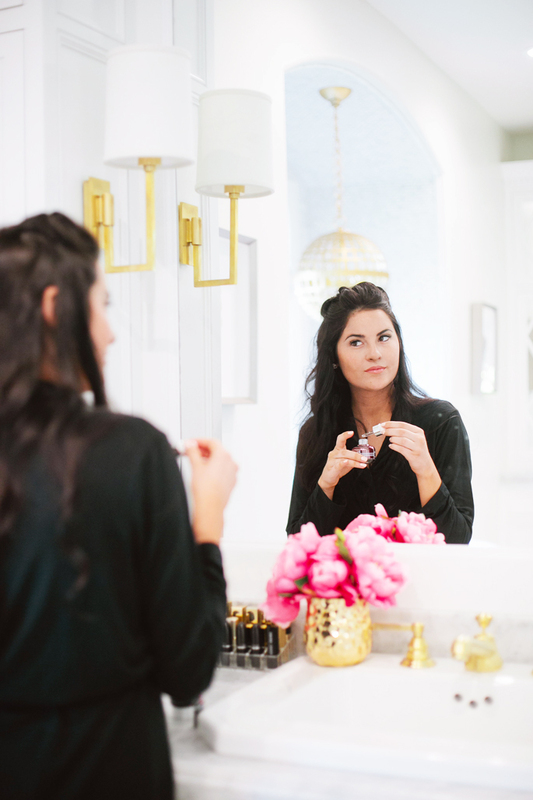 The Black Rose Face Oil contains hydrating natural oils with scents that are so soothing and it gives my face a subtle tingle that makes my skin feel so fresh. The oil acts as a moisturizer too, so if you use it in the morning/evening it keeps your skin hydrated. Finally, another product to keep my lips hydrated is the Sisley-Paris Phyto-Lip Twist, that is a tinted lip balm (adds color and moisture). 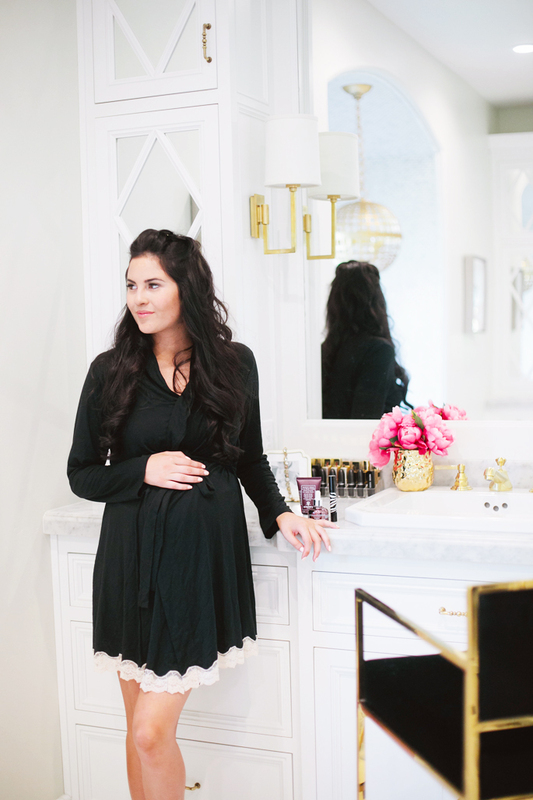 My life tends to get crazy (and exhausting) at times chasing a one-year-old around, especially now that I’m in my third trimester. I can feel my body wanting to slow down and I get tired so much faster than I typically do when I’m not pregnant. Lately, my favorite thing to do for some relaxing time is to lay in my bed with a huge bucket of movie theater popcorn (such a craving of mine when I’m prego) and watch the bachelorette. The last two weeks I’ve put on the Black Rose Cream Mask while I watch the bachelor and chow down on my popcorn. Next Monday after a hectic day of school, work, chasing kids around, etc. go get a bucket of popcorn (and maybe some chocolate), put your pajamas on and do a face-mask. I promise it is SO relaxing! I’ve not heard a lot about Sisley skincare before, looks amazing! Great picks! Will have to give them a try. I love lipsticks and your PJ is adorable. Hope pregnancy is going well Rach. That’s so true, I love to relax with a face mask, either watching my fave show, or in a bath, definitely with some chocolate! I’ve been trying face oils recently and have been very impressed (and I have oily/combo skin), I’ll have to check out the Sisley one. Sending lots of relaxation vibes your way!! I love finding new masks to use! Going to check this out! Love your robe! So pretty! I’ve been dying to try out that black rose mask – can’t wait!! I haven’t heard of this brand before. I’m excited to check them out! Love trying out new skin care products! That mask sounds amazing. I can’t wait to try it. Thanks for sharing about this line! I always love watching people’s skin care routines on snapchat! 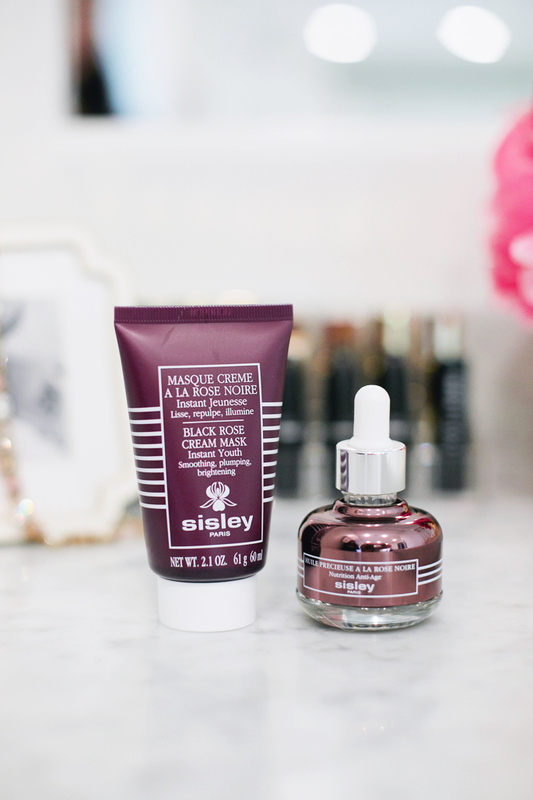 I get so many good ideas to try new products and Sisley is now on the list! Love your robe! Love hearing about new products to try! Oh I LOVEEE finding new items to try. Great overview! I love face masks! My fave brand for them is LUSH. Their masks are made with natural and fresh ingredients. The masks only last a few weeks in the fridge… but they are SO worth it. I also love pureeing avocado and olive oil together for a homemade and all natural mask, very hydrating!! These products look absolutely luxurious! I’ve used the Black Rose Cream Mask a few times and love it! I’ll have to try the the rose oil! Ah I am definitely going to try that! You are gorgeous! Thanks for the tipps. Your face is glowing since you are preggo again! Perfect moment! I love the photos! I love to see all of the different types of products you’re using!The mask and face oil look amazing! Sisley Paris sounds fantastic! I think I’ll have to try it myself sometime soon! These look super great! Thanks Rach! Is there a reason you don’t ever update your Shop My Instagram page? You wear so many great outfits on Instagram, yet don’t update them on your page. It would be really helpful if you could do that. I have heard great things about Sisley products; I may try them out!! Have to try these products! Thanks for the post!! I’ve seen a couple bloggers talk about this line lately and it’s peeked my interest! I really love trying new skin care products and definitely new masks! I’ve never heard of Sisley Paris! Seems like they make great products! I love your pictures!